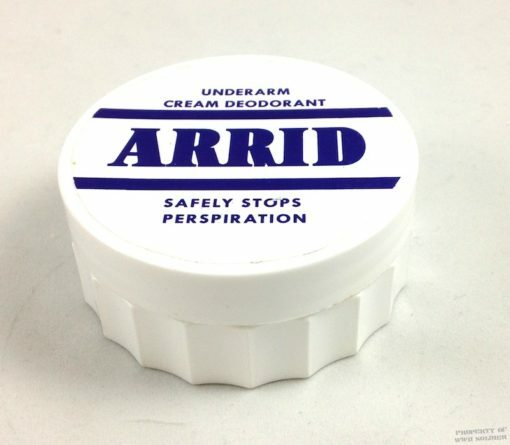 Our Arrid Underarm Cream Deodorant comes in a WWII Arrid reproduction Box. Active Ingredient: Aluminum Sesquichlorohydrate 17%. Inactive Ingredients: Water, Glyceryl Stearate, PEG-40 Stearate, Cetyl Esters, Glycerin, Dimethicone, Isopropyl Palmitate, Petrolatum, Lanolin Alcohol, Lanolin Wax, Hydroxypropyl Methylcellulose, Fragrance, Titanium Dioxide, Lanolin, Propylparaben, Mineral Oil.